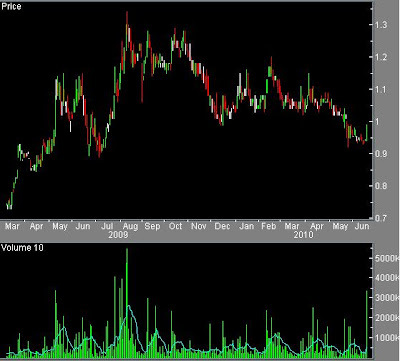 Stocks Unleashed: Fajarbaru (RM0.99): Volume surged. Something's brewing inside?? Fajarbaru (RM0.99): Volume surged. Something's brewing inside?? Fajarbaru's shares suddenly surged with huge volume. Something's brewing inside?? Anyway, looking at the balance sheet, the cash level is unbelievable. They have RM123mil cash, equivalent of 74 sen cash. What are they going to do with the money? Preparing for some real big project to start off? Are they planning property development, probably in Port Dickson or Malacca or are they expecting to secure some projects soon? Possible project awards include LCCT Aprons/runways and awards from its local project tenders worth RM400 mil. I'm putting in 7% of portfolio into Fajarbaru for now.